After graduating from college and working happily as a dental hygienist, Celine’s left leg started to drag when she walked. Celine could tell that something wasn’t right and immediately made an appointment with her family doctor. She was then referred to a neurologist for further tests. "When the neurologist told me I had Multiple Sclerosis (MS), I was confused," she says. It was 1987 – before the internet and technology at our fingertips. "I didn’t know what MS was." The doctors told her to go on living and that she would have many years to enjoy her career. She was never told that one day, she would be in a wheelchair. Multiple Sclerosis (MS) is a degenerative disease in which the nerve cells in the brain and spinal cord are damaged, affecting the nervous system resulting in a range of physical problems, such as vision loss, muscle weakness, and loss of coordination. The disease is twice as common in women as in men. There is no known cure. A life-long resident of Welland, Celine lives in her own apartment. For years, Celine admits her stubbornness got in her way. She couldn’t accept her disability and struggled. Celine spent hours travelling back and forth to a clinic in Toronto. The clinic would send her home with the equipment she needed, but she was left on her own to set it up and install. Celine’s life changed when she met with the Augmentative and Alternative Communications (AAC) team at Hotel Dieu Shaver Rehabilitation Hospital. AAC uses various communication aids for those unable to use traditional methods of communication, such as writing or speaking, due to an illness or traumatic event. The AAC team met Celine and her family to assess her needs. Celine has limited use of her hands, making writing and typing difficult. The AAC team prescribed technology to help. Celine needed a larger keyboard to help her type, and a special mouse that looks like a joystick for better control on the computer. 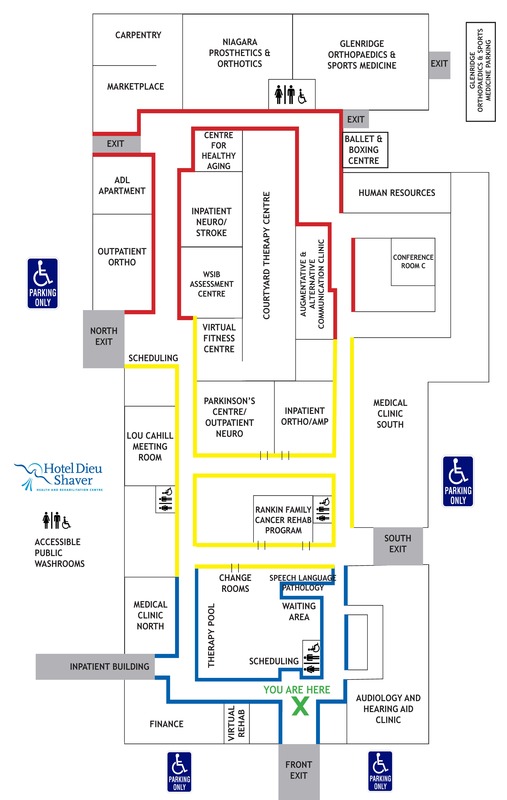 Nicole Johnson, Registered Occupational Therapist with AAC, explains that Hotel Dieu Shaver is unique in the services it provides. "We’re lucky in that we can go to Celine’s home, assess her in her own environment to see what she needs to make her the most comfortable," Nicole explains. "We can train Celine on the equipment in her home, set up the equipment exactly where she needs it and where she will use it, so that she is confident and comfortable." For that, Celine is grateful. "Hotel Dieu Shaver changed my life tremendously, and they’re a big part of my new found positivity in life," she says. "Hotel Dieu Shaver has been a lifeline. They opened my world." For Celine, advances in technology over the past 30 years have made it possible for her to maintain a connection with the outside world. 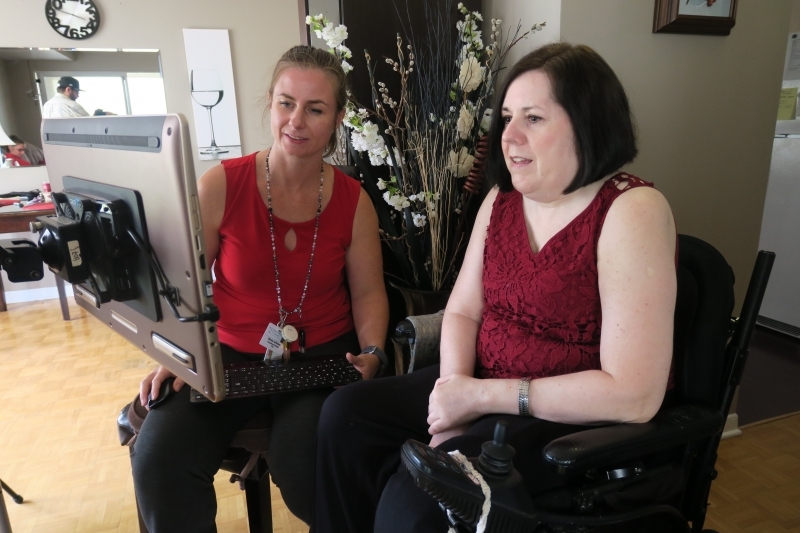 She relies on technology to get through most of her day, from getting up in the morning to going to bed at night. She can now use the internet to keep in touch with her family and friends, and has met her boyfriend on a dating website. "We met on a disability site - he’s also in a wheelchair. We understand each other and we can share our experiences on navigating the world in a wheelchair." He calls her on Skype every night to remind her to take her medications. "It’s beyond what I ever hoped could happen."